1.Download the Swicegood Auctions App from the Apple App Store, or Google Play online, or go to our website to see the auctions and items that are available to bid on. 2.Navigate to the auction or lot you wish to bid on, and click on the “Sign In” button. 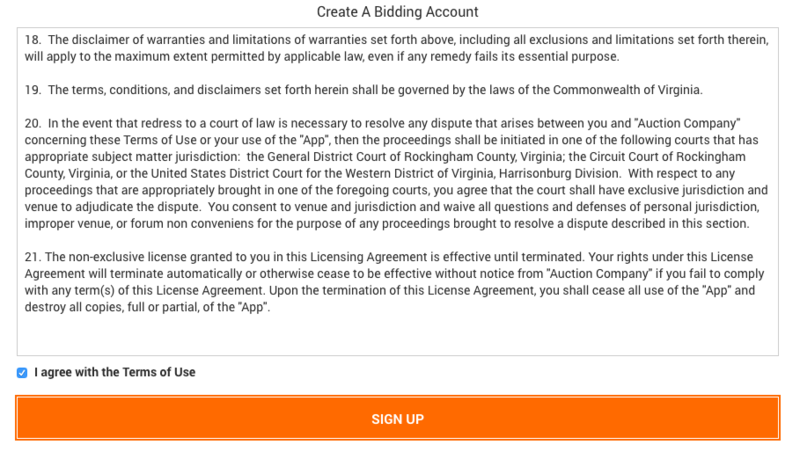 3.From here, you can click on the “Sign Up” link to create a new bidding account. This is also where you can reset your password, and sign in(if you have an existing account) to view the auction. 4.Follow the instructions by entering your first and last name, a valid email address, and a password at least 8 characters long. 6.Once your bidding account is created with a username and password, you are now able to register for a specific auction. Navigate to the auction you wish to bid on, and click “REGISTER TO BID”. 7.Now, enter in your contact information, and click submit. 8.You may be prompted to enter your credit card information in a specific auction. This is only to verify available funds, and will not charge your credit card.